The Sun transits your 1st House of appearance, personality and popularity. Circumstances, relationships and events tend to benefit you during throughout the month. Your personality and beauty stand out as others find your presence attractive, captivating and contagiously upbeat, Sagittarius. This is a stand out month for you, Sagittarius. A New Moon occurs on 12/2 in Sagittarius. Good news, Sagittarius. The Sun, Mercury and a New Moon occur in your 1st House on 12/2. This signals your personal New Year in Astrology and is a time to sign documents, begin a new project or make a commitment in an ongoing love relationship. Singles can meet someone special throughout this month. Couples will take the next step in any ongoing romance. Love looks up for all Sagittarius throughout December. Mercury (communication skills, logic and reasoning) enters Sagittarius (your 1st House) on 12/4 - 12/24. During this transit, you will attract the attention of others with your communication skills, written and spoken. Since Mercury also rules transportation, be careful while travelling, in transit or while driving this month. December is an ideal month for all Sagittarius, especially where their love lives are concerned. Singles can meet someone rather unexpectedly while couples could announce a birth or become engaged. A fresh step in an exciting direction is featured this month especially for those coupled Sagittarius. 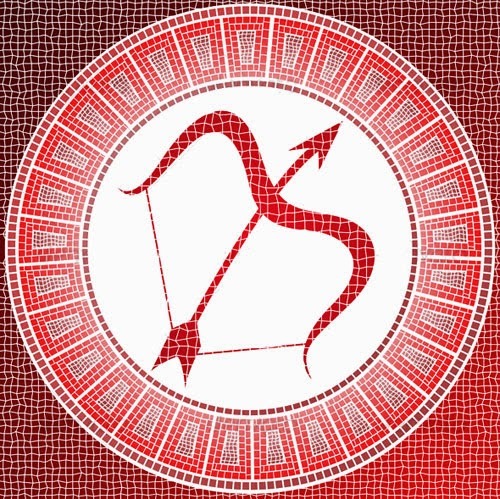 During this transit, Sagittarius will benefit via their personal, social and professional communications with others. Networking, sending out resumes and meetings with like minded types promise to yield positive developments, whether you are single or coupled. Venus (love, harmony and romance) begins the month in Capricorn. Capricorn is your 2nd House of personal valuables and deals with your self-worth. Venus in your 2nd House brings about more appreciation from your business relationships and from associates and focuses your attention more closely on your material and financial affairs. Expect women to be especially helpful in your love life and where your personal possessions are involved. Venus will retrograde on 12/21 and this retrograde will impact all signs, Sagittarius. Expect to find your personal expenses rising or a bill coming in the mail that surprises you. Venus will be retrograde from 12/21/13 - 1/31/14. This is a long transit. Take a clue from Cancer this month and learn to become a saver, not a spender, especially on large items/purchases. Mars (motivation, sexuality and physical energy) begins the month in Virgo and enters Libra on 12/7. Libra is your solar 11th House. If you're going to partake in the Holiday festivities, make sure you have a designated driver for ideal results, as a tough angle to Mars hints at possible legal issues, especially during the last week of the month. In other words: Do not drink and drive and make sure your car, if you have one, is in the best working order. A costly repair is a serious possibility. With the planet of war/aggression (Mars) in the compatible air sign of Libra, you will enjoy time spent with groups, your long term friends and any organizations to which you belong, and this socializing will tend to be your biggest motivation throughout December. The 11th House represents your dreams, hopes and personal aspirations. Focus on your goals and get to work on 2014 during this transit. Realize how powerful the art of thinking is and how it can benefit you. The expression that timing is everything will apply to you throughout this month. Think positively and focus on your aspirations and inspirations. Mars can bring about impatience, so while you're having a great time socializing, some around you might not be in the greatest of spirits. Be grateful and extend kindness to anyone who has been helpful to you throughout 2013. A Full Moon occurs on 12/17 in Gemini, your 7th House of marriage. Singles could be making announcements about his or her personal life, while couples will be making a greater commitment to one another. You could feel low on energy, tired and drained on this Full Moon but your love life keeps you actively motivated. This will be a romantic and memorable night to remember. Get plenty of rest on this Full Moon. A Gemini and a Virgo are involved. An Aries, Libra and a Leo are involved. An Aries wants to see you be the best you can be. This person will support you and encourage you, especially where a long term relationship is involved. A Libra will capture your attention and demand more face time with you. A Leo could want more than you're willing to give this month. With Leo, you could feel or sense that something is missing. A personal or professional relationship might need a serious overhaul, especially during Venus retrograde at month's end.